I bought my Nankangs from a mob in the West of Melbourne called "Motorsport Wheels & Tyres". They were able to source them with no drama, despite the size of 135/15 being laughable beside the road roller sizes they normally manage. That was, however, 12 months or more ago, so I guess importers and their stock can change dramatically. Why not call/contact Nankang & find out? In Tasmania, Sparco sell them but . . .. Given that the CX-668 is such a horrible wet tyre (& its very square shoulders rather unsuited to camber change), you might want to consider the, not wonderful but very much better in the wet, Nankang AS-1 in 145/65. Despite being 14% shorter in the sidewall it is still capable of accommodating camber change. In either case, given that these sizes are slow-moving, I'd be very wary of "old stock" & I suggest insisting on a manufacturing date stamp of no more than 18 months ago (if there's anything worse than a tyre poorly compounded for the wet, it's a tyre whose poor compounding has gone off with age). I have used Nankang CX668 (and its Nankang predecessor) on Daffyduck since 2008. In fact it is THE tyre used by most Raiders as its about the only tyre to fit a 2CV that is readily available in Australia and it is much better than Michelins on bad dirt roads. It is a better tyre in the wet than the Michelin X 125/15 (which I have on my daily drive 2CV). I haven't driven my 2CV fast enough in the wet to notice if there is a problem. I did drive Daffyduck on the Eastern Creek racetrack one Shannons Classic Car day. Apparently I attained a speed of 115kph down the main straight and continued at that speed around the left hander (I have long legs and when I stretch them the accelerator pedal gets pushed into the floor). I also drove Daffyduck from Wilcannia to Gosford in drenching rain, so much so that a passing road train threw up an avalanche of water breaking the fan and giving a very uneven engine until the remains of the fan were disposed of. I would have no hesitation recommending Nankangs for a 2CV. I am on my third set. I never have them balanced. Quite a few years ago I bought Nankangs in Canberra for my 2CV. It could have been Allstates Tyres in Fyshwick or possibly Fyshwick Tyre Service. Don't know if they'd still supply them, but you could ring Nankang Australia to find out who are their resellers in Canberra. A month ago I was trying to source some Nankangs for my 203 Peugeot. No-one could help until Tom from TTF in Braybrook, Melbourne managed to locate some. His email is [email protected] -worth a try. See, the 2CV is closely related to super-high performance road-mashers. Loads of tyres are fine in fairly steady state situations & adequately signal their problems as the loss-of-grip envelope is entered. Some such tyres have a further problem however. Place sudden demands on them in the wet (the emergency swerve or brake or both combined) & the transition from grip to no-grip is dramatically fast & difficult to control. The arrête pattern X is notorious for this (the defunct SDS & Xrn variants less so) as, to lesser extents, are the ZX, XZX & Xas. The CX 668 has this fault. It is obscure to me why one would choose it over the AS-1. Odd then, that the EU 'wet grip' rating for the CX 668 tyre is 'B', one step better than the rating for the AS-1? Last edited by Ken H; 19th September 2018 at 07:13 AM. First, the EU wet grip rating is only a wet braking rating according to a set protocol (& the score varies within a tyre type according the size). I certainly mentioned wet braking but mostly spoke of lateral grip. Surprisingly to some, the two disciplines can be disjoined, especially in deeper water. As for the shoulder, the issue is not rigidity, it is profile. The CX-668's is very square edged & this means that it is prone to climb onto a shoulder edge under lateral load & roll-induced camber change & lift the inner portion of the tread. I stand by my comments on Nankangs in all conditions on a 2CV. My tyre pressures are NOT the recommended 20 PSI front, 26 PSI rear as recommended by Citroen. I find 20 PSI front and 22 PSI rear under normal (bitumen) use give a more neutral balance for cornering. It lets the tail wag sooner, but with front wheel drive the throttle will get you through a corner easily. In the wet, the bad news comes sooner, but with less lock committed the recovery is quicker. The real danger in a 2CV when at the limit is a front end slide. Braking too late in the wet before a corner can have you sliding straight ahead. The 2 PSI difference front/rear given a nice neutral balance for cornering. Pressures above 20 PSI front can cause "chatter" on uneven surfaces, which I experienced years ago between Ballarat and Bendigo. Again, when the wheels chatter, the fronts lose their adhesion and backing off is the cure. In gravel or sandy conditions, tyre pressures are lowered to about 15 PSI front, 17 PSI rear. These lower pressures work well on corrugations. In Sydney traffic during a cloudburst, the limiting factor (other than the traffic) is poor visibility rather than poor traction, thanks to the lack of air conditioning and fairly useless demisting options. I tend to control my speed using the gears and throttle and very rarely touch the brakes. Ducks love water. A 'real life' test of 2CVs braking in the wet? It's invariably the back end which lets go, especially if the driver presses that middle pedal. When racing a 2CV, you are at the limit of accelerative power, so the rear will break because you can't accelerate away from the problem. If you have power to spare and your natural reaction is to accelerate rather than break (most people do the opposite), a front wheel drive will pull you out of strife. With a rear wheel drive in the same circumstances, there is a lot of opposite lock required to stabilise the car. This is a far more difficult art to master rather than the front wheel drive point and shoot. The worst situation I have had in the wet with a 2CV is a front wheel slide, the result of realising I should have taking a left turn, braked and turned at the same time. Taking the feet off all pedals rectified the problem, and having nothing to hit helped a lot. Michelin X do not have an ideal tread pattern for the wet. Nankangs do. Nice! Thanks. I thought the red snail towards the end did a nice bit of controlled avoidance & recovery (maybe s/he was on the AS-1, or better still, the, no longer available here, Conti EcoContact EP). A radial works laterally by way of sidewall distortion which doesn't (much) involve tread distortion. The braced tread remains relatively flat (compared to a cross ply tyre) & migrates towards the centre of the car on the outside, more "loaded", tyres. To allow this lateral migration, the sidewall folds under & moves along the spectrum from "parallel" to the wheel face to "parallel" to the road (at which point the wheel rim digs in & the car falls over). There are some nice period road test photos of R8s & R10s on X & ZX & using Renault-recommended (low) pressures with the rims about 10 mm from the tarmac during track testing. In terms of roadholding, such tread migration maximises tread contact (& thus roadholding). The outer edge of the tread is still doing a lot of work though. Two further technical features help the tyre to keep that migrating tread as flat as possible without jacking up on an outside edge (cross ply style). One, instantiated by Michelin's so-called Optimised Contact Patch design, builds in some controlled distortion of the contact patch belting so that more of it stays in contact with the road under high lateral loads rather than jacking up on its outside edge & lifting its inside edge off the road - this is not a universal feature. The other is simpler & more widespread: use rounder tread edges rather than squarer tread edges so that some inbuilt geometric accommodation & amelioration of jacking tendencies is present. The jacking tendency is exacerbated if the wheel adopts positive camber & the whole frame of reference for the tread migration is tilted. Edge treatment becomes even more important here. Of course roadholding is but one desirable trait of a tyre/vehicle. Handling crispness of response is another. The steering wheel turns the wheel rim & for the tyre tread to move as a result of this, the yaw-inducing force has to be transmitted from rim to tread by the sidewall. A totally rigid sidewall would transmit that twisting force perfectly but would not then have the flexibility to fold & allow the tread migration spoken of above. So, compromises occur. 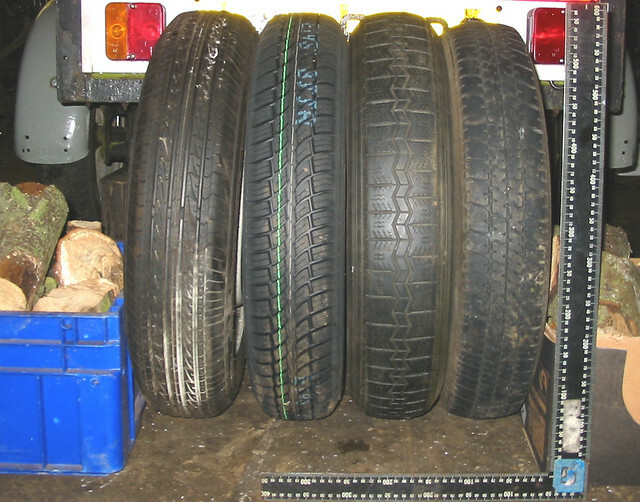 What usually occurs is that the part of the sidewall by the bead is made more rigid by way of so-called "flippers" (extra fold-up plies) & "fillers" (inserted harder"rubber" wedges) with more flexibility being present closer to the tread edge for that (tread migration facilitating) folding under to occur (& for bump compliance). Ceteris paribus, a shorter sidewall assists handling crispness in virtue of having less length to have to twist to get the tread moving. There's also less length to allow ready tread migration without tending to jack & lift the inner tread edge. This is why low profile (short sidewall) tyres don't work well on any vehicle which suffers substantial camber variation on cornering. The AS-1 is 65 profile & shorter sidewalled than a 135/80 CX-668 (or Toyo 330 or Firestone F560 or a Michelin 125/80 - actually about 82). 65 is not dramatically low profile. It is also a bit wider & rounder shouldered. And less highly siped. Sipes are good for wet grip (given the film-cutting benefits of the slit edges & facilitation of micro road imperfection interlocking) but promote block instability & thus degrade handling stability & crispness of response. The sipes & a fair amount of longitudinal channeling would be the story of the EU B wet braking rating of the 668. As already noted in another post, the AS-1 shoulder blocks are high rigidity & by this is meant that the blocks themselves do not distort (as more highly siped or closely grooved ones would) & thus transmit cornering steering inputs more rapidly without having to distort & stabilise before being able to do so. (This is an initial turn-in point & distinct from the earlier discussion of the tread edge of the migrating tread.) Note that wet grip is compound-related as much as pattern-related. The pattern prevents aquaplaning but the compound (& siping) does the micro engagement interlocking with the road. Whilst not as right-angled as an X pattern, the 668 pattern is a "square-shouldered" design & the AS-1 is rounder. Greater handling responsiveness, wet or dry. Better lateral grip, wet or dry (partly a compounding point). Better transition behaviour at the limit (thus helping to maintain control in an emergency) especially in the wet. Better dirt road grip (more open tread). Lower life. Lower comfort. Noisier. Less fuel efficient. Anyway, obviously buy what you want. I have no shares in the AS-1 & wouldn't choose to fit any Nankang tyres on any of my toys but you guys don't have many options. If you are happy with the CX-668 then fine; my only thought was that a better option existed in a non standard size. Last edited by 4cvg; 22nd September 2018 at 10:16 PM. citroenut and cjl like this. The daily 2CV that I fang around in has Michelin X 125/15. With one point remaining on my current licence, I am not really interested in an AS-1 performance tyre as I expect this would relegate me to a period of walking. I turn 73 in January and hopefully by then there will be an extra 3 point buffer. As one of the NSW roads authority's best customers over the last 55 years ( I always pay in full on time) I think they treat me with disdain, but they hold all the aces so I can't argue with them. About 300% uprated springs, last time I checked, plus adjustable dampers. The control tyre has changed over the 'almost' 30 years that the series has been running, going through 'anything goes' at the start, most recent changes being from Firestone F560 (135 or 145 section), Michelin ZX and is currently the Toyo 310 (135 only). Oddly enough, there's a video on Youtube of the very first race, held at Mallory Park back in 1989. Things get more interesting when competing at Spa, especially if competing in the category which uses BMW motorcycle engines. Ye gods, a 310 (not even a 330, far less the current obsolescent 350). It'd be interesting to have them settle on the Conti EP in 145/65 (fronts for the first Smart). I predict that there'd be more people able to manage skilled recoveries of direction - still an entertaining spectacle for the viewers.